On matters of the natural world, members of the faith and science communities do not historically find much common ground. These two groups are increasingly joining forces, however, to inspire a mobilization of energy and resources great enough to effect a “great turning” in the planetary story of Earth’s climate. People say the topic of climate change is “political,” said the Reverend Thomas C. Ferguson, rector of St. John’s Episcopal Church in Sandwich, during a recent interview. “The issues around ‘care for creation’ are so complex that faith communities alone are not going to be able to effect any kind of conversation,” Mr. Ferguson said, emphasizing the importance of Sunday’s forum. As the audience found their seats, sunlight streamed through the windows and lit the robin’s egg blue ceiling of the St. John’s sanctuary, mimicking the clear skies outside. The three presenters—using only the power of their words, without graphs or PowerPoint presentations—spoke quietly and with conviction. They were Philip B. Duffy, president and executive director of Woods Hole Research Center; the Reverend Margaret Bullitt-Jonas, missioner for creation care of the Episcopal Diocese of Western Massachusetts and the Massachusetts Conference of the United Church of Christ; and forum moderator, the Reverend Paul Minus, co-chairman of the Cape and Islands Faith Communities Environmental Network. “We are the generation,” he said, whose actions will determine whether this opportunity for a great turning will be embraced in ways that change the trajectory of human and planetary history. “We are trained to simply report the facts, but now our findings compel us to public advocacy,” the release said of the scientists. Dr. Duffy spoke about the role science plays in the earth’s current climate crisis, acknowledging that it may seem strange to speak of urgency in addressing a problem whose signs can be difficult for people to see. Science, he said, can describe what the physical world will look like with and without strong climate policies; it can begin to illustrate the consequences on water availability, human health, and the ability to grow food, and how the populations most affected by the climate crisis often have no voice in decisions that affect them profoundly, including generations of unborn children. 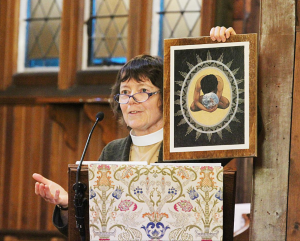 The Reverend Margaret Bullit-Jonas, missioner for creation care at the Episcopal Diocese of Western Massachusetts and the Massachusetts Conference of the United Church of Christ, holds up artwork representing humanity’s “inner world” at the “Tackling the Climate Crisis NOW” forum at St. John’s Episcopal Church. Dr. Bullitt-Jonas opened her remarks by showing two props she had brought. A globe represented the outer landscape—the living planet with its complex ecosystems, diverse creatures, and delicate atmosphere. An icon showing a human with arms encircling the Earth represented the world we carry within us: how we make meaning, what we value and consider important, what motivates us, what we feel and long for, and how we choose to act—the inner landscape which religion studies. Dr. Bullitt-Jonas described the planet as “groaning” and “calling out for another way to live” as she quoted two recent reports: the World Wildlife Fund’s recent report that 60 percent of the earth’s mammals, birds, fish, and reptiles have been wiped out since 1970; and the United Nations Intergovernmental Panel on Climate Change’s major report that planetary warming is well underway and that time is running out to avert climate catastrophe. She offered the audience examples of the roles faith communities can play in helping effect “the great turning” on climate change. Faith communities can address the feelings of helplessness many people feel when fear and grief about climate crisis overtake them. Faith communities offer rituals and practices of prayer and meditation that transform minds and hearts. Faith communities provide moral leadership, she added. Faith communities can inspire bold action; they have a long history of leading movements for social and environmental change in this country, and of people of faith putting their bodies on the line for the causes they believe in, she said. “Faith communities tap into our capacity to dedicate ourselves to a cause that is greater than our personal comfort and self-interest,” Dr. Bullitt-Jonas said, drawing attention to a new interfaith initiative, LivingtheChange.net, where people can commit to making personal changes among the three areas that most affect personal carbon footprints: transportation, household energy use, and diet. During the question and comments section of the forum, one woman asked Dr. Duffy if the actions taken by individuals to address climate really make a difference—or do they serve only to keep people’s anxiety down? “It is important to be involved at any level,” Dr. Duffy advised. The behavior of one person sets an example and influences the behavior of others; things catch on until they become the norm, and that’s very important, he said. Dr. Duffy told the story of his first job in high school working at a recycling center. “At that time, recycling was for weirdos, but very, very quickly it became the norm,” he said. In other comments from the audience, a 27-year-old man from West Barnstable stood up and told the audience that he and his friends pick up plastic along the road in their neighborhood; a West Tisbury woman asked about the relationship between climate change inaction and depression; a mother from Sagamore Beach said that it was her daughters who talked their parents into a tradition of “meatless Mondays” at home, and that she believes young people are very attuned to the problem of climate change. Jann Czarnetzki of Sandwich asked a question about the melting of the glaciers. Jerry Wojcik of Sandwich pointed out that climate studies began during the Johnson Administration and said it is time for us to step up. Dr. Minus reminded the audience that major historical transformations of the scale now necessary for the climate are built by a steady stream of countless small, incremental steps. They know the importance of working deliberately to keep their own ecological spirit and spending time with like-minded others, he said. They know the importance of acting vigorously to end patterns of the carbon-consuming behaviors that our society has taught us to believe are normal. They know the importance of working politically to elect environmentally-committed candidates for public office. They know the importance of using financial resources, great or small, to support as many organizations as possible that are working to help the environment and the importance of divesting financial resources from the fossil fuel industry and investing instead in earth-friendly companies and products. Dr. Duffy’s advice was to ignore the “climate skeptics” and put time and effort into informing and motivating the people who already deeply care about the environment. “That’s how social change happens,” he said. Dr. Bullitt-Jonas said that it only takes 10 percent of a population to move a cause forward and create social change. “We need to recapture a sense of the sacredness of the natural world,” she said. “As wounded as it is, the natural world has such healing power, yet studies show that Americans spend only  percent of each day outside, and that includes time spent driving in the car,” she said. Sandwich resident and church member Stephen G. Tom said that St. John’s Episcopal Church has been looking for ways to facilitate something focused on the greater community. “This topic is important to everybody,” he said, adding that there is so much overlap between the faith and science communities that it makes sense to work together. “I believe that our grandchildren and their grandchildren will remember us with gratitude,” Dr. Minus concluded.